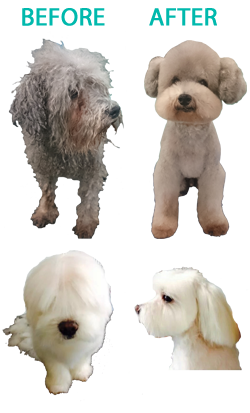 I am an experienced, certified and licensed expert pet groomer, providing convenience, one on one, stress-free pet grooming at competitive prices in a comfortable, low stress home environment grooming studio. I will provide you and your loved pet the quality grooming you expect and deserve in a fully contained and safe environment. I know the importance of your family pet and I’m committed to making him or her feel safe, comfortable and stress-free while in my care. I use all natural, bio-degradable shampoos and conditioners because they are not only safe for pets, but they are also safe for the environment. Being a professional groomer, I understand the particular grooming needs for every different breed. Please call me with any questions you have and to book an anointment. Note: All fees listed below are base prices. Additional fees may apply based on your dogs coat condition and behavior. Please call for an accurate quote.